All by Chanz: What's so real about it? Recently there was a debate on one of the prominent TV channel on the TV reality shows. People were tryin to debate on whys and why nots. The claims "why people are scared to face the truth?" and "What's need to make money by makin someone's personal life a mockery in front of the camera". Barring few, most of the reality shows that's being aired in channels are nothing less than sheer crap. I have seen "roadies" once when i was surfing the channels. This bald headed fellow slaps some guy and comes out with a slur of abuse(most of which pointing to his mom, sister and whole family). I was thinking, how do they air it in the first place. Then next day my friend was telling about this program to me and he was goin all GAGA about this program. What the crap ??? Then, recently heard about splits villa, where guys and girls stay together and do 'tasks' all in the name of reality shows. I heard some girls became celebrity just by their verbal abuses which even a loafer would be envious of. Then this recent hit 'Sach ka Samna', can the host or the producer or the director of the show ask similar questions to their own wife, mom or sisters with a stupid polygraph connected to them??? Rakhi ka Swayamvar...., better nothing said about this. There are lots many (excuse me if i've missed any of the happening reality show) but do people have to be a Harvard educated to tell if we really need these kind of reality shows??? The irony is the channel that airs filth in one side, on the other side they air such debates to show their concern on the society. Take their licenses and ban these channels for the sheer hypocrisy. There are so many filthy, worthless crap filling our living rooms through these channels spoiling the society and kids. The most disturbing fact is that these so called 'youth specials' portray the modern day youth in such a bad light. It's a shame that any one who sees these programs would definitely visualize the modern day youngsters as spoilt and ready to take life to any extreme. Not to ignore the fact that, the society is westernized and lots of things do happen which are not so inline with our culture and ethics. But, what's the need to bring them to the fore as if they're normal way of life? When people come out in open with these filth and get away with that, everybody might start thinkin, its a way of life and with short memory of people we can get through anything. Not sure how many readers are with me in my thoughts..but seriously "SOMEBODY STOP IT!!!" Folks who are ready to watch and enjoy, people like us who hate these shows will look like jokers. In this reality shows world, soon you may see camera's going into our private rooms and name it as a show and I am sure 1000000s of vultures would be ready to watch that. this post has come at such a right time.. yest whilst i was channel surfing i watched Rakhi ka swaymavar and was like 'just what the hell is she trying to do on national television' and the boys and their parents? 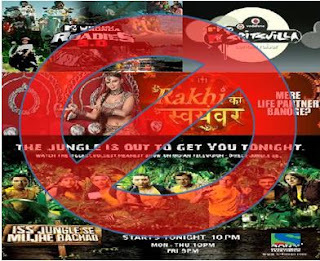 just what were they thinking..
there is nothing 'real' about these shows except some TRPS and the subsequent money that make producers laugh all the way to their banks..
@AJCL - More than frustration a fear as to what are we leaving to the future generation...just filth n nothing else. Well they ahve heard some of our prayers and some of the shows has been Banned!! !Thank God!!! Thanks Government for Saving the so-called "Generation-Gap" Kids and ol fellas like us!!! well said , and u know the reason for it ? check this out :) when time permits.